"The Adventures of Pearley Monroe" is truly amazing story. Each chapter ends on a cliffhanger, which is always solved in the next chapter. The book has interesting charachters, in which many climbed their way in, and just as suddenly disapeer from the story completely. There were times that the story told of racism and segregation of that time. It is written in a manner that pulls me into the book deeper. I reccomend this book to other fourth graders. Oops! I misspelled characters and dissapeer. Sorry! Thanks so much Jackson! I loved this story when I first heard about it and worked hard to learn how to make it a great book that I would have loved to have had when I was in middle school! I love cliffhangers too! The cliffhangers are my favorite parts of all the chapters! I think the characters are also interesting. Nice review, Jackson! You used lots of detail in your comment. I wrote this in a reply for Dean's comment. I forgot to write about the cliffhangers! I also like your review, and I like how you wrote about everything you did. Dean , Michael and Elisa... I am so glad you loved how the chapters ended. Part of a writer's job is to make sure the reader loves the story o much they want to turn the page to find out what happens next! Your comments were full of great detail and I am making sure that I make a few changes in the manuscript because of the awesome input I have received from all of you...my readers! I want to know where this book is being sold as well, and some of the chapters end in creepy and mysterious ways. Hi Skyler and Lillian.. I also will have a lot of pictures of what life looked like in 1880's in the book, including a real picture of Pearley and his family. This book will be available at a lot of places..so hopefully others will be able to read it and learn more about California history. I wonder where this book is going to be sold too. I agree with all of you about everything. I hope I get a copy. I know this book will be available on Amazon.com, but I am also friends with a bookstore owner in Folsom who said she would like to sell my book plus, I hope that libraries will have this book so that even if people don't buy it..they can read it! This is a team effort and YOU have been apart of the team to make this a great book that others will want to read! Thank you so much! ''The Adventures of Pearly Monroe'' is a very good book. I think that having a cliffhanger at the end of almost every chapter is very clever. The prologue is not excitement packed but don't stop reading just because the prologue isn't THAT exciting. There are some sad parts, but I don't want to discourage anyone so, I won't mention them. I hope that anyone reading this book finds the part about a certain prissy woman from Boston hilarious!! The characters are very well described . Pearley is a clever boy who was very curios especially when somebody with bad rumors about him saves Pearley's little brother Grant. If I was able to rate this book I would give it ten-thousand stars. I think that you should buy and\or read this book. I know that I will try to get it and I will definitely read the rest if it somehow. You should read this book!! Please comment!! I would give The Adventures of Pearly Monroe 500,000 stars. Lillian and Maya.. If I could rate how much I appreciate you reading my book I would give you...a bizzilion stars. The reason I wrote this story is because when I heard about it I loved it and a man who helped out at the museum said..someone needs to write this story, so I took up that challenge and I am so glad I did. There are great stories all around us. I hope one day to read one that you wrote so I can give it 500,000 stars! Thanks Lilly for replying on my post. Doesn't feel like we read this book super fast? It does to me. The Adventures of Pearly Monroe is a great book for anybody who loves adventure books. I really like that each chapter ends with such a mysterious ending because that makes it extremely exciting. When Pearly was on the tree trying to catch the thief he must have been super brave. I really hate Louisa’s mom because she is so stuck up and prejudice. My favorite character is Louisa because she is never upset easily like her mother. It was really fun to listen to the book when Mr. La Marr read it to us. I would always recommend this book to anyone who wants to find an exciting book.l ways recommend this book to anyone who wants to find an exciting book. Mrs. Barnsworth wasn't very nice in the beginning..even though she was beautiful on the outside the way she treated people wasn't attractive. Thankfully, she was able to learn a lesson and apologized to Chen before she left. I am so glad you thought it was exciting to read because it was exciting to write! The Adventures of Pearly Monroe is very good book. I like it because, it teaches you a lot about the Monroe Family. The book also has some humor in it. I like the end of chapters because they leave you hanging most of the time and are very suspenseful. I would recommend this book for lots of people. I don’t really know where they are going to sell the book but I want book very very bad! Noah, I hope others like this book as much as you do! I am so glad you liked the humor as well as the suspenseful endings. "The Adventures of Pearly Monroe" is a very thrilling story, with a great plot. My favorite part about the book is that each chapter ends with a cliffhanger. It makes me very eager to read the next chapter of the book. The characters are very interesting, because some of them are mysterious, and others are well understood. The book takes place back in the 1800's, so many things are different than they would be today. I like that about the story. Every chapter kept my interest, and I never got bored. I thought it was nice and simple to understand. I strongly recommend this book for anyone to read. Can you imagine living back in 1880? There are a lot of things that are different now, but somethings are still the same like ..the importance of treating each other like we want to be treated, being honest, and being a good friend! Thanks for reading and recommending this book to others! Also, I like the literacy concepts and words in the book. I am definitely getting the book once it comes out! I also liked the cliffhangers too. I forgot to mention about the cliffhangers in my comment. Hi Dean, I am glad you liked the words.. I am planning to add a small glossary at the end of the book for some of the words and terms such as CHANDLER who was mentioned in the prolog. A Chandler was someone who knew how to make candles and soap! Can you guess what they used to make candles out of in the 1880's? Sorry! I misspelled Pearley's name! Actually it is tallow which is beef fat. It had to be rendered..which means they boiled it to get out the impurities before they poured it into candle molds or hand dipped the candles. Can you imagine how many candles they must have burned every year? I sure can't. "The Adventures of Pearly Monroe" is an excellent cliffhanger. At the end of each chapter there is always an unanswered question which always urges you to keep reading on. I found some of the characters interesting and likeable because of their personality. My favorite character is Pearly because he is a very adventurous person. In some parts of the book some racism and segregation was involved in that time. The way the book was written was very understandable and it was very fun to listen to. It kept my interest with the cliffhanger in the end of each chapter. Some concepts in the book like racism, inequality, and hatred are relevant in the book. I recommend this book for other fourth-graders and I hope they will find it as interesting as I do. Impressive post, Colin, as you've used what you have learned in literacy and discussed concepts that you found in The Adventures of Pearley Monroe. We didn't even talk about that in class, but you put them in your review. Nice job! Colin, inequity and racism is a sad part of our history. We can't change how people have treated others in the past, but isn't it nice to know we can treat each other with respect and continue to make a difference in our communities and in the world we live in. I love The Adventures of Pearley Monroe! What I like best of all is the structure of the chapters. At the end of every chapter the author leaves you on the edge of your seat, wanting to rush into the next chapter. I also get caught up in all of the excitement going on, such as the story of Lefty Miller looking for his right arm. Last of all, I love the time period this story is taking place in. Life in Coloma sounded exciting after the Gold Rush. I can't wait to finish the book. I loved going to the museums, libraries and even the old cemeteries to learn all I could before I started writing this book. I grew up near Coloma. We lived on a road that the Pony Express used to ride up and down on and as a kid, I used to imagine what that would be like..to hear the thundering hooves of a horse being urged on by it's rider. History can be a lot of fun. I am glad this book is helping you imagine what Coloma must have been like during those Gold Rush years. I agree! The structure of the chapters is good.Lefty miller looking for his right arm has a lot of excitement. I think Lefty Miller is creepy!! How is Lefty Miller creepy? Wellllllllllll............ I wil say that he is 10% creepy, but i'm not really scared of ANYTHING. Do you remember how Pearley said Lefty lost his arm? He lost it in the Civil War..The reason I thought of adding him into the book was because I have a photo of my Great-Grandma's grandpa who ..you guessed it..had only one arm because he was shot in the civil war! I used to sleep with a night light on...just in case! Lefty Miller is a little scary. I'm not scared of Lefty Miller. O.K maybe a little scared. He is pretty scary, I mean he lost his arm! I think Lefty Miller sounds a bit creepy. You students are so LUCKY!! I can't wait to read this book and I can't find a copy of it ANYWHERE!! I have looked high and low. I have searched and searched! I ordered a copy to be signed by the author but ... like Quentin says..."How am I gonna be able to wait?" Hi Corree! I agree... Mr. LaMarr is an amazing teacher! I just read all the wonderful insights his students wrote and am so impressed at how articulate and thoughtful they are to the story plot, characters and the actual writing. It was so fun to see the picture they took of the whole class when they went to Coloma and visited the the Pioneer Cemetery where the whole family was buried. This book is being printed and will be available by Gold Discovery Day ~ January 24th. It will be available on Amazon.com and hopefully in several bookstores. These students are part of my TEAM...they are the ones who are helping me make sure the manuscript is ready and they have done an amazing job! I have no doubt in my mind that someday I will be reading some of their books! Thank you, Marci. I am fortunate to work with great kids each year! I am glad that you found their words insightful. They have really enjoyed your book, as you can see from their posts on this blog. The Adventures of Pearly Monroe is one of the best books I’ve ever read. Even though I’ve only read twelve chapters when the book gets published I intend to read the rest. I think this book is extremely fun and exciting but since it is based on a true story its very educational too. This book has a lot of happiness, humor, love, and joy but also some of depression, grief, and fear.I would give this book 999,999,999 stars In the best books you can feel the characters emotion; I can do that with this book. Thanks Clara! I am so glad you love this book! I am glad it made you think about what it was like in the 1880's and also how people felt. I think you will like the rest of the book and all the photos that are in the book when it comes out in January! The Adventures of Pearly Monroe is a very good book! I rate it 5/5 smiley faces! :):):):):)! At the end of each chapter there is a very exciting part that makes me want to read more! I am totally going to buy it! The Adventures of Pearly Monroe is an exciting book, and it is also full of sad, happy, and tense moments too, like on the last day of school, the spelling bee, and the explosion at Gold Bug Mine. One of my favorite parts is how the characters and events are described in vivid detail, and that is wonderful. I also like the dialog, because that was the way that slaves spoke back then, and this book emphasized that. The reason slaves spoke that way was because of the fact that the slaves didn't get to go to school as slaves. This is overall a very good story that needs to be read. I am very glad that Marci Weather wrote this book. I am sorry! I meant Marci Seither, but auto-correct put in weather. One of the first goals Andrew Monroe had when he came to California as a free man was to learn to read and write for himself. He had to work hard, but he new that getting a good education was important. I am so glad that you are taking your education seriously..keep up the great work! I'm glad I have my mom and dad right there when I need them. It' s a bit sad that Andrew didn't though. “The Adventures of Pearley Monroe” was a very good book for me. The first chapter takes place in the gold rush around the 1850’s. When we started reading the prologue and the first chapters, it was exciting because we were reading a book that was not even published yet. My favorite character in the book was the main character, Pearley. My favorite chapter in the book, from chapter 1-12, was Chapter 12. I thought it was very surprising to find out who the actual thief was. Well, I guess not a thief, “I forgot her name” actually hid the diamond bracelet to make sure that Chen, the Chinese boy, would go to jail. On January 24, when the book comes out, I will make sure that my mom or dad will buy this book because this book is awesome. I hope other kids are interested in “The Adventures of Pearley Monroe”, because like I said, it’s awesome. The Adventures of Pearly Monroe is a great story. At every end of each chapter there is always a unanswered question at the end of each chapter. This book always end with mysterious questions. It’s amazing how the cops got Chen. Mrs. Barnsworth was being really racist to Chen when she thought that Chen stole the diamond bracelet. Thanks Ben! I am glad you have liked the book so far and think you will love the ending! It was a lot of fun to think of all the characters and Chen and his grandfather were important. The Chinese worked hard in the mining industry but also were so instrumental in getting the railroad built! The Sacramento Railroad museum has a great exhibit that talk about their contribution to California. I think The Adventures of Pearly Monroe is one of the best books I've read all year! In the first twelve chapters there is a lot of different feelings and emotions. This book has great detail and description. It was very easy to understand and fallow along with. It's one of those books where you have a lot of fun reading it and you don't want to stop! At the end of each chapter, the book just leaves you hanging and you want to read more! I would not only recommend this book to other fourth graders, but to anyone from just my family, to someone from a whole other country! There is a part in this story where it is quite sad, but I can't tell you what it is. If you want to know what that part is, then I guess you're going to have to buy the book! 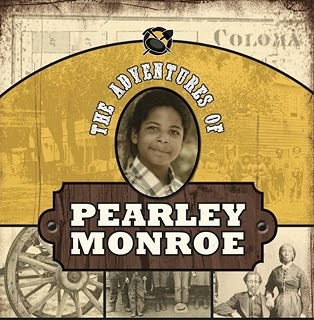 The Adventures of Pearly Monroe is a great story! Claire.. you just gave other readers a great cliffhanger..I will bet you would be a great story teller! “The Adventures of Pearly Monroe” was a terrific book. I really liked the first eight chapters and chapter 9-10 was pretty awesome too. The best part was when the sheriff caught Chen. I also really liked the explosion at the Gold Bug Mine. A really sad part was when Rose died. Hope I meet you. I really think this is an excellent comment. I can't wait to read the book!! I was so glad when the real thief was caught! I imagined how terrible it was for Chen and it is a good reminder to not judge someone before you know the truth! I have to admit.. I cried when I wrote about Rose. The real Monroe Family had a few babies who didn't live very long. Life was hard and sometimes losing a loved one was part of what they had to deal with. The one thing I noticed when I go to old cemeteries is that the headstones often say how many years..months and days someone lived. It reminds us that every day is valuable. I hope I get to meet you too! It was very sad when Rose died, but the good old days weren't so good. I think that The Adventures of Pearley Monroe is an excellent book. I love how you can really tell how the characters feel, and how it seems like you’re really there. There is a sad part in one of the chapters. I started crying because it felt like I was really there witnessing the depressing event. That part really ties in the emotion after the excitement in the chapter before. The characters are very in-depth and seem like they are right there in front of you. These people are real, and their story in this book is the best one I've ever read. I can’t wait to finish it. I give it ten out of five stars; it is that good. Elisa, I have to admit.. I cried when I wrote the part about Rose. I am so glad the characters seemed real to you. Pearley Monroe lived in Coloma and then moved to Sacramento where he worked, but he still had property and a house in Coloma and when he retired he lived there until he passed away in 1963. I am so glad you lived this book so much to recommend it to others! Rose almost made me cry too. Rose made me cry as well. Because of all the great comments I received I did some changing to that chapter. I made sure readers knew that Rose was not suffering but very peaceful and also I ended the chapter a little bit before so that Pa wasn't building a coffin. I think it made the chapter sad, but it made it not quite as sad. I think you will like it better and I appreciate all your help in making the story better! A few years after the gold rush in California, there is a 12 year old boy named Pearly Monroe, who lives with: his dad Andrew, his mom, his grandmother Miss. Nancy, his brother Gaunt, and his younger sister Caralisa. He is the star of the book and was a real person who lived in Coloma. This is a very exciting book and good for young readers around the age of 7-11. The book also has true facts about Pearly and his life. One of the true things about Pearly`s life is his mom was going to have a baby, but a horse kicked his mom`s stomach.That caused the baby to be born too early causing the baby to be too small so she died. Pearly goes on many adventures and this book takes you on all of his adventures. One of the adventures he went on was when his brother fell into a river and almost drowned, but a miner saved him. Over all, I think this is a great book and in particular for young readers and this is one of the best books I've ever read! Thanks Luke for the AWESOME review! This story has a lot of action and adventure, but I will bet you would be surprised at how many other great stories there are that need to be told. I hope you find one and write about it! I really like the book. I like how at the end of each chapter the story ends with a cliffhanger. That makes you want to read the next chapter even more. I do not really like Mrs. Barnsworth because she sounds bossy. I think Mrs. Barnsworth blames mostly everything on the Chinese. I like how you have all this history in the book because I didn't even know Perley Monroe was real. I will recommend this book to other forth graders. When this book gets published I will definitely buy it. Nina, I totally agree that Mrs. Barnsworth is bossy, arrogant and judgmental. I am glad that in the end she realized she was wrong and did the right thing by apologizing to Chen. I am glad Luella and Pearley could still be friends. Thank so much for the great review. I grew up in El Dorado Hills, not too far from Coloma and I didn't know that Pearley Monroe was a real person until I read a small brochure about his family. You never know when or where you are going to find a great story! Thanks so much for all your great comments! I love reading them and have actually made a few changes to make the final book BETTER because of you! I also re-wrote the last paragraph of the book because I thought...what would make my favorite 4th grade class smile? You wrote an exstremeley great book. I wonder what you will write in the last paragraph. If I do meet you I want to be the one thanked. Will you be writing any other books soon? Hey Marci-You have our interests piqued with what you wrote in the last paragraph of the book! Michael.. I will make sure to thank you! Adrian.. what other book would you be interested in? Maybe someday you could write it! I would love to read it. I would like to see a book about a kid in the Civil War! I totally agree with you on the 1st,4th,5th, and last sentence Ryan. I think The Adventures of Pearley Monroe is a good book and that I cannot wait to read the rest of the book when it comes out on January 24, 2014. The first twelve chapters of the book were very exciting and after each chapter I wanted to read the next chapter. The Adventures of Pearley Monroe is filled with excitement, sadness, scariness and so much more. The book makes me feel like I am in the book myself in 1848 through 1849. All the first twelve chapters in my opinion,are excellent. I agree the first twelve chapters are excellent. I never was able to wait for Mr. Lamarr to read the next chapter either. The cliffhangers made me want to sneak away and read the next chapter by myself. It's fun to be feel like Pearly Monroe and to be back in the years of 1848 and 1849. When I read the first chapter I new the other chapters will be good to. That was a great comment. Thanks you so much for letting me know how much you loved the book. I have to say that I loved writing the book so much amd really felt like I was part of the Monroe family. In fact, I was a little sad when I finished writing it! I loved thinking about what it would have been like to live in that time...can you imagine having to build a fire in a wood stove to bake bread and make your own butter from the cream you got from the milk. I will bet they were never bored! And, I am glad that you weren't bored when Mr. La Marr read this to you! "The Adventures of Pearley Monroe is a great book. The actions of the plot are great. Each chapter ends with a phrase that makes you want to read another chapter. I liked most of the characters, except Mrs. Barnsworth,she seemed unethical. Mrs. Barnsworth thought Chen had stolen the bracelet, but that was the paradox because Chen didn't steal the bracelet. This book has great history everyone should learn. I would recommend this book to every 4th grader. I hope to get this book myself someday. I love ''The Adventures of Pearley Monroe'' and I can't wait untill it comes out and I really want to buy it. When Mr.LaMarr read me and my class the first 12 chapters of the book I new that I would want to buy it, even when my teacher had only read the prologue. I think that most 4th graders will absolutely love this book. Melia, I am so glad you like the book. I think you will like the rest of it as well! I hope you think about writing a story..just think of a great character and then begin to imagine the adventures you will send them on! I hope I get to read one you wrote someday! Hi Kenneth.. I have to say that when I was doing the research I found several different spellings of Pearley's name.. I finally found his signature and it was PEARLEY so that helped me! In the first twelve chapters of The Adventures of Pearley Monroe are full of surprises, mysteries, and action. All of the chapters, or at least most of them, end on a cliffhanger. I like all the characters it’s hard to pick my favorite one. When our teacher was reading the book I felt like I was right next to Pearley going through what he was going through. The history of this is all true. The Monroe family is real; you can find their graves in the Coloma Cemetery. They are labeled as ‘Gouch’ because that was their owner when they were slaves. Marci wrote the book in a way where it always keeps you on your toes, anticipating when the next twist comes. I think all fourth graders should read this book. From the first twelve chapters, I think this will be an excellent book. I loved seeing the photo that your class took when they went to the cemetery! You are right..learning about the Monroe family made history seem so real.. Nancy and Peter had the last name of Gooch because they were owned by William Gooch. When he sold their 3 year old to the Monroe family ..Andrew's last name became Monroe..I am so glad that California was admitted into the Union as a free state. I think you will like the rest of the book as well! Thanks you for your thoughtful post! I think that the book The Adventures of Pearley Monroe is a great book for everyone to read. Every chapter leaves you in suspense, waiting to see what’s going to happen next. Also, when Pearley tells about Lefty Miller looking for his arm and the two outlaws who were hanged and they’re still looking for their body’s, or the body of someone else, it’s funny to think that on some nights three dead people are walking around looking for arms and body’s. It’s sad though when the newborn baby, Rose, dies. If I were to make a quote for this book, it would be something like, “An exciting and adventures, fun book with lots of spaz based on the California Gold Rush.” I will absolutely buy a copy when it gets published. I love this book and I hope you will too. I also hope you’ll buy a copy for yourself [whoever’s reading this]. This book is going to get published in January, I’m pretty sure. Overall, I love this awesome book! Thanks Sophia... I really like your quote for the book! History has always been one of my favorite subjects because it is full of great stories and I am so glad I got to share this one with you. Thanks for saying thanks! I'm glad you liked my quote. I agree this is an awesome book! Logan, I am glad you liked the facts that were put into the book, I think reading a story is a great way to learn about California nd what life was like in the 1880's! In my opinion ‘’The Adventures of Pearley Monroe’’ is a great book! At the end of most chapters there is a unanswered question, but in the next chapter the unanswered question is answered. There are sad parts in this story, but I won’t spoil them, I promise. I think all people that are interested in the old days should read ‘’The Adventures of Pearley Monroe’’. I recommend 4th graders reading this book, but if your not a 4th grader and your wanting to read this book, go ahead because I think this book is very awesome. The book will keep you from being bored. In my opinion once you read the first chapter you will want to keep reading the book. When this book comes in stores I am so going to buy it. You should really buy this book and read it!!! If you don’t want to read this book that’s fine too, but in my opinion this book is great! I agree that everyone should read this book if they want to.I also agree that people shouldn't spoil such a great book. When I first heard about this story I did a lot of research then wrote the story. After the story was written I had to re-write it several times. Finally I took a class that talked about what makes a great story..cliffhangers! So I spent all summer re-writing it again and I am really glad I did. I wanted to write a book that I wished my kids could have read when they were in the 4th grade. Thank you for such a positive review. I agree that it was sad when Rose died and that this was an awesome book. Logan, I decided to change a few things in the chapter about Rose. It is still sad.. but not quite as sad.. Thank you for all you comments. It made a difference in the final book! I think The Adventures of Pearley Monroe is epic. I would buy this book probably the day it comes out- if my parents will let me of course. This book will teach you about California in the 1880’s while telling you the action packed adventures of Pearley Monroe. This book has sad and happy parts that will make you cry- either with happiness or sadness. There are cliffhangers on the end of every chapter, which makes it very addictive. In conclusion this is a very good book. Wow... I am so excited to think that my book is EPIC! I love that you enjoyed the cliffhangers and can't wait for you to read the rest! I think that the The Adventures of Pearley Monroe is a great book based on facts from the 1800's. I really enjoyed this book! The tension builds as the book goes on in some chapters it really left me at a cliff hanger. A soon as this book comes out I will be the first one to buy it, actually I might as well preorder it myself as it is a very good book.Each end to the chapters end with a exiting unanswered question that makes me encouraged to hear more. I would rate this book Five stars if I could, me personally would recommend this book for all ages not just for fourth through sixth grade readers. Marci Seither truly put some work, time, and feeling into this book. I did put a lot of thought into this book because it was such a great story. When I went back to ask the museum if they had more information on Nancy Gooch they only had a small sheet of paper. I couldn't believe it! It was a beautiful story! Someone said..you should write it and so I did. I had to learn a lot about history and how to write a book, but I think it was worth it. Someday you might have a challenge that requires a lot of hard work...do it! You will be glad you did too. 4th grade is a challenge that requires a lot of hard work! Keep at it 4th graders, and as Marci says, you will be glad you did! Hard work and determination often provide the background for success. I think the Adventures of Pearley Monroe is the best book I have ever read in my life! I like it because all of the book is written from true facts.When this book comes out I will buy it as soon as I can.The best thing about this book is the cliffhangers at the end of each chapter.My favorite chapter is "Explosion at Gold bug Mine" because at the start of the chapter it was nice and calm,than at the end there was lots of action and excitement! I think everyone around the world should read this book right now! If I could rate it I would rate it 5 stars.This to me was truly the best book in the world! I really hope I can get my hands on this book! I love all the people in this book because they are all real people. Again this the best book I have ever read in my entire lifetime. Pearley Monroe helped dig the grave for James Marshall, the man who first discovered gold. He was someone who had a good reputation because of the way he worked and the way he treated others. I wish I could have met him in person! The Adventures of Pearley Monroe is a true story and the author is Marci Seither. I really like this book because of the characters. My favorite character is Chen, but I haven't read the whole book yet so there might be more characters I like. I like Chen because in one of the chapters the cops and Mrs. Barnsworth accused Chen of stealing her diamond bracelet and Chen runs away, but Chen didn't do anything. I also like the book because of the cliffhangers at the end of each chapter. The anticipation makes me anxious to start the next chapter. The book is a great book so when it comes out I'll ask my mom to get it. If my mom says no I will try to convince her to buy the book. I'll even pay with my own money if I have to. I think every fourth grader around the world should read The Adventures of Pearley Monroe. Again, I really like the book The Adventures of Pearley Monroe! I loved Chen and his grandfather. We lived near Dutch Flat for over 10 years and there was a lot of Chinese history there as well. The Chinese worked very hard and were often treated badly because they were different. I think it is a good lesson on how we should treat others as well. I am glad Pearley stood up for Chen. I am glad Mrs. Barnsworth learned the truth and changed her mind about being rude. Thanks class for the great reviews! I am so glad you loved the story and that is was filled with real facts. A lot of interesting things happened when California when it was becoming part of the United States of America. The more I researched the more I discovered. Do you know who became wealthy during the gold rush? I will give you a hint...he didn't mine for gold. I think the answer is Sam Brandon. Also, I'd like to say that I am writing some books of my own. I also think it was Sam Brannan. Good job on the spelling, Noah! Yep Elisa you are right. Sam Brennan was one of California's first millionaires..however by the time he died he was penniless. In fact it was several years before anyone even wanted to pay for his headstone...but there was man who came to San Francisco in 1853 to open up a small store...several years later..about the time Pearley came to CA on the train..a tailor from Nevada told the merchant that he had made an invention to help make work pants much sturdier. Because of how hard the work was, people needed to have clothes that didn't rip and wear out so fast...The two men took out a patent on the new clasp called it a rivet. You might have one of these rivets in your house! In fact, if you are wearing Levi jeans, you might even be wearing them right now! The Adventures of Pearley Monroe was one of the best books I ever read. I think the author Marci Seither is good at what she does and I am eager to read the rest of the book. My favorite part of the book is emotional but still interesting. The part that I like the most is when the mom in the book gets kicked by a horse while being pregnant. In the next chapter, she gives birth to a premature baby which eventually dies. That was sad and I almost felt like crying. An author that can make her reader feels some emotions is a good writer. I really like this book and you should to. I think that the book The "Adventures of Pearley Monroe" was a great story you could use to describe "detailed". Every time a chapter left the class at a cliffhanger, I was really eager to hear the solution. My favorite part of the book is when Pearley chases a raccoon up a tree and how he just saves himself by scrambling off of a branch that was about to break! I think everyone should read this book and love it. The last thing is out of five stars I would give this book...5! I am glad I got to read this book! The Adventures of Pearley Monroe is a very well-written book. I recommend this book to all fourth graders. Each chapter ended with such great cliffhangers, I say in my mind, “Don’t stop, read another chapter!” My favorite character is this book is Pearley Monroe because he stood up for Chen when he was named for stealing a diamond bracelet, owned by Mrs. Barnsworth, who is a character I do not like. She is rude, mean, and prejudice and was when she noticed that her bracelet was gone and immediately blamed Chen. Pearley fixed this by gathering proof. First, Pearley told Louella, Mrs. Barnsworth’s daughter, to put something shiny into her hair or put a sparkling necklace or bracelet onto her hand. Louella replied saying she had sapphire combs, so she stuck them into her hair. Then, Pearley told her to walk around the streets. Louella did do this, but with no luck, didn’t find the thief. Pearley came up with a second plan, which worked…okay. Pearley told Louella to put her sapphire combs next to her window, which would be open for the thief to see them. Pearley then hid. Soon, the thief, well, animal, took the sapphire combs with him. Pearley chased the raccoon down and caught him. Finally, turned in the proof to Mrs. Barnsworth. This kept my interest very well and could understand everything. It also had humor as you saw. If you didn’t see, then you’re going to have a surprise. Personally, I think that this book is mostly about friendship and fear. Friendship is mostly in this book when Pearley gathered proof and finally said that it was a raccoon stealing jewelry from the Barnsworth. Because their rich and wealthy, they have very expensive luggage and most of it is shiny. The raccoon liked the shiny stuff and took it with him. It’s mostly about fear in this book when Grant was drowning in a river flowing rapidly, but a miner saved him. Also, there was fear when the Gold Bug Mine exploded and many miners were injured. If I could rate this book on a scale 1-100,000,000,000, it would be 100,000,000,000. Darn, i see that i didnt put a space in a sentence. The Adventures of Pearly Monroe is really a good book. It has really strong wording and exciting parts especially at the end of each chapter. The book was really exciting when there was a hand on Pearly’s shoulder and when there was a gunshot. You used a lot of description and detail. My favorite book that we read together as a class is Number The Stars because it has a lot of excitement and action in it. The main character is Annemarie Johansen and she risks her life to save her best friend Ellen Rosen because Nazis solders from Germany are rounding up Jewish people and relocating them. Annemarie has to save Ellen and her family because the Rosens are Jewish. can tell The Adventures of Pearley Monroe is a great book. The part I liked the most so far is the tale of Lefty Miller. I liked the tail of Lefty Miller because he brings adventure to the story. This book is full of excitement and fun loving characters like Pearley and his friends. Another part of this story that I like when the raccoon stole Mrs. Barnsworth's bracelet because of the suspense, mystery, and the ridiculous truth about the thief. I can’t wait to read the rest of this wonderful book. If I could rate this book on a scale of one to one-hundred stars I would rate it 100,000,000,000,000,000,000 stars! Sorry, I meant "I can tell" in the beginning. Oops, I did this on the wrong year. I meant to do this on the two thousand fifteen Adventures of Pearley Monroe blog. This book is very well shaped and has a lot of educational action.